I can barely believe that three years have passed since I released the first episodes of The Thoughtful Travel Podcast. (The scarier part is that those first episodes still get listened to regularly! They’re not terrible by any means, but I sure sound a lot more comfortable as a podcast the more years pass!). The podcast has brought me so many wonderful new friends and connections, so many lessons and interesting tales, and above all, so much fun and satisfaction! Thanks to everyone who has been a part of it. Well, yesterday was my birthday, which means this week is the THIRD anniversary of The Thoughtful Travel Podcast. That’s three years of the chance to chat with awesome, like-minded, travel-loving people from all around the world, and to share the results with a fabulous audience who challenge me with their interesting questions and share their amazing travel experiences with me. 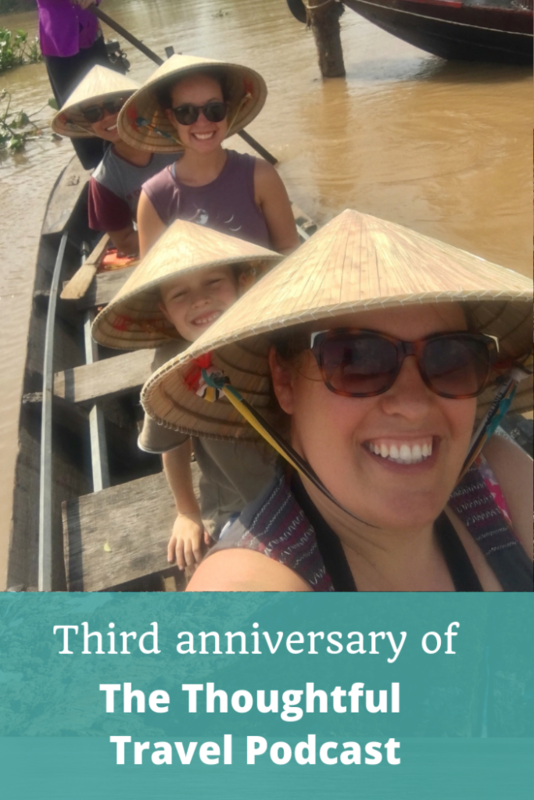 In this special third anniversary episode I answer questions from listeners (via the Thoughtful Traveller Facebook group) about topics as diverse as accommodation, language learning, photography, travelling with kids, environmentally aware travel, destination choosing and more. I also divulge some of the statistics behind the listeners and downloads of The Thoughtful Travel Podcast which I kind of obsessively follow (it’s my maths degree that makes me love the stats, I think!). A huge thank you to every one of my listeners, whether you’ve just started tuning in to The Thoughtful Travel Podcast or you’ve been there since day one, a whole three years ago!